For my birthday my husband bakes me the most remarkable gluten free cake, Italian Cream Cake! It is a oist, ense, cake wi yummy nuts and coconut. I just love it. Cream sugar and butter well. Add egg yolks and beat week. Mix the buttermilk and baking soda, let foam. Alternate the flour with the buttermilk in the batter, add vanilla. Beat egg whites until stiff, fold into the batter. Fold in nuts and coconut. Pour in to 2 greased 8" or 9" round baking pans that have parchment or wax paper lining the bottom. Bake 25 min at 375. Don't overtake, check with a toothpick. Cool in pans. Bring 2 cups water to boil in large, heavy-bottomed pot. Stir in rice and and salt. Cover, simmer on low until water is almost completely absorbed ( 15-20 min). Add milk, half-and-half, and sugar. Bring to simmer over medium-high heat, then reduce to maintain simmer until mixture starts to thicken. Stir frequently. Reduce to low after about 30 minutes, and continue to stir every few minutes until all liquid is absorbed. Remove from heat. Stir in vanilla extract. *this is also great Arroz dulce, with an additional 1 1/2 cups sugar, 1/2 cup dried fruit/raisins, and 1 tsp cinnamon! 1. Wash the spaghetti squash and cut in half (short way). Stand on ends in an 8x8" baking dish. Add 1" of water, cover with foil, and bake for 45-60 minutes at 350F until tender. Let cool until you can make the "spaghetti" out of it. Set aside. 2. Saute the spinach in olive oil with garlic, salt and pepper, set aside. 3. Heat 3-4 cups of your favorite spaghetti sauce, set aside. 4. Add a little milk to the ricotta cheese so it is spreadable. 5. In your 8x8" baking dish, pour out the water and layer 1/2 of the spaghetti squash. 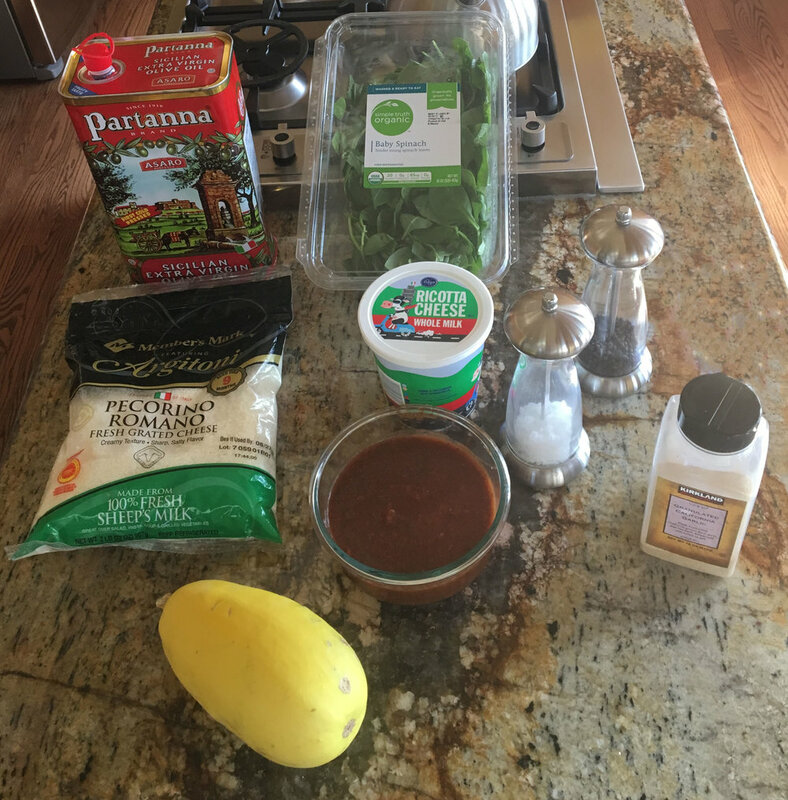 Sprinkle some Romano, then 1/3 of the spaghetti sauce, all of the spinach (with as much liquid squeezed out as possible), and spread all of the ricotta cheese, Next, layer on 1/3 of the spaghetti sauce and the other 1/2 of the spaghetti squash. Top it with a little more sauce, romano and mozzarella. 6. Bake for 30-40 minutes uncovered until hot and bubbly. You can also sauté any of your favorite veggies to layer in this. When I was a little girl, my grandmother would make lasagna but my grandfather didn't like the ricotta. She would slice hard boiled eggs on one of the layers for him! These are the best cookies hands down! I came across this recipe while trying to create a snack for my daughter who has many food intolerance's, while also wanting a cookie my other daughter (who does not) would appreciate. You know - the one that says "Mom! You have 2 kids!" I haven't adjusted this menu at all since it comes out so well, or tried it with different flours. What I have done is left out the chocolate chips and sprinkled them with cinnamon sugar and the result is a tasty Snickerdoodle. I've rolled it out into a big circle for a giant cookie for a graduation - it gives you plenty of room to write! I have also created a giant heart-shaped cookie for Valentines day! I hope you enjoy it as much as we do. Let me start by saying there is so much unhealthy food out there, it’s mind boggling! Eating healthy can be difficult, and eating healthy with food allergies and sensitivities can make the grocery store feel like a minefield. My daughter had some health issues as a child, and the antibiotics she took were very detrimental to the health of her gut. As a result, I know well the pain of a little girl who wants desperately to eat pizza and cookies with her friends, but the risk of unknown ingredients and cross-contamination make it nearly impossible. I couldn’t find any pre-made, or baked, goods that she could eat. With food sensitivities to gluten, egg, diary, rice, potato, quinoa, and virtually all grains but buckwheat, I had to create foods with her sensitivities in mind. A good rule of thumb: it’s hard to go wrong with raw meats and veggies that you can cook yourself. Organic products can not be GMO (genetically modified), so I purchase organic whenever possible. Go as far as your budget allows with clean food. I shop all over the place, wherever is convenient. Natural Grocers has all organic produce, so you don't have to look for it, and they have the best bulk items - including super prices on herbs. Trader Joes is good for meat. We eat a lot of poultry and pork, and some ground buffalo. I’ve found ground buffalo to be healthier than beef due to the guidelines that it’s grown and processed under - the thought of mad cow disease really scares me. I should also note, I do have another daughter who loves gluten and has no food intolerances. She still reminds me on occasion that "I do have 2 daughters, and could I please make some “NORMAL” food,” which made my kitchen trials that much more tricky. I could: make two of everything because, of course, I had unlimited time, let one or the other of my girls fend for herself there may or may not have been days this started to seem a legitimate option during the teenage years, or find ways to make my recipes “normal” enough for my first-born. I invested in a bunch of different ground grains to experiment with. My favorite is almond flour. There are many good recipes on the web with almond flour. I use a combination of 5 or 6 flours, plus almond flour. If you’re working around nuts, you can substitute a similar flour. Seed flours, like sunflower seed meal, will use about the same amount of moisture and are fairly close in texture. I find coconut flour hard to work with, as it absorbs all the liquid and tends to "grow" rather than "batter". One time, I made coconut pancakes that turned out more like hockey pucks - so I called them scones and we ate them with butter and honey. Thankfully, my family is flexible like that. I rotate flours with prices and availability of what I can find. Eating clean and healthy is not cheap! I do most of my baking into muffins, rather than breads, for a couple of reasons - they tend to bake more evenly, they portion easier, and they are easier to store/freeze. Baking with gluten free flours can be challenging because they appear done before they really are - I always add 5-10 minutes to baking time. I have put them back in the oven after taking them out only to find them "medium rare." It’s all about experimenting. I always use cupcake papers, it keeps them more moist and much easier to get out of the pan, clean up is a breeze. I don't use xanthan gum, or guar gum, for the simple reason that I don't like the way they taste. If you are making something that needs to hold the bubbles in the dough to rise higher, use the mixer. Don't over beat. My 2 favorite weapons in the kitchen are scoops, they make my muffins and cookies all the same size! I use a number 20 for muffins/meatballs and a Tablespoon for cookies - this comes in so handy for holiday baking! Below is my formula for making gluten free flour mixes, have fun and enjoy. And remember, if it doesn't work out the way you want - you can always put butter and honey on it!